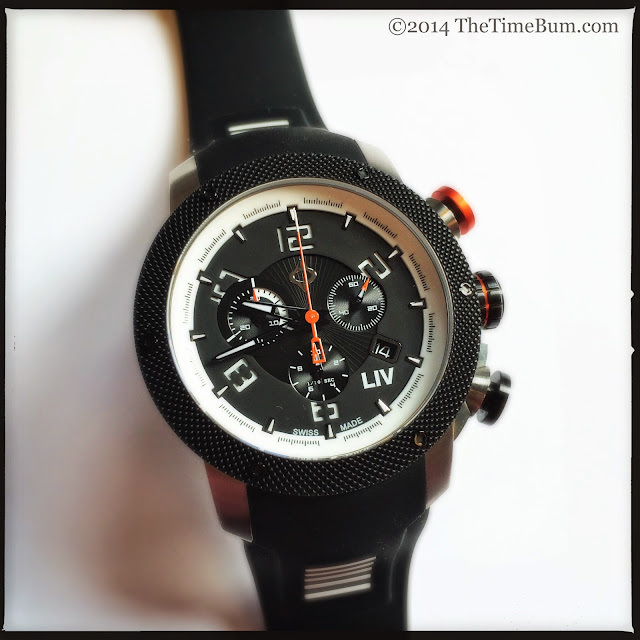 According to their website and Kickstarter page, LIV watches are designed for the "LIV Man," a fellow who is "masculine and rugged while effortlessly fashionable... A natural leader and trendsetter... Who won't be told what to do." Apparently, he is also active, wears LIV branded bike jerseys and shorts, and is likely a good 15 to 20 years younger than this broken down Time Bum. There appear to be hundreds of these guys out there because the company is currently enjoying a tremendous run of crowd funding on Kickstarter, surpassing its goal by over $100k and counting. For this watch review, the folks at LIV provided a Genesis X1 Chronograph prototype with a brushed stainless steel case, white markers, and a black silicone strap. 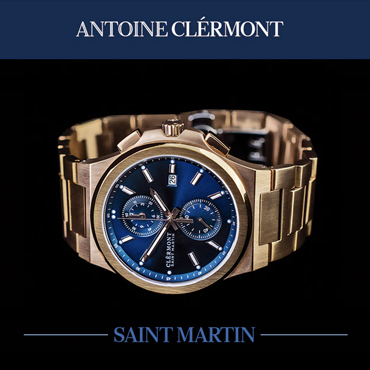 It is a bold sport watch, Swiss made, with a sapphire crystal and 300 meters water resistance. While it is not a final product, and certain elements will be improved before production, it is a well made piece, exhibiting a high level of fit and finish. 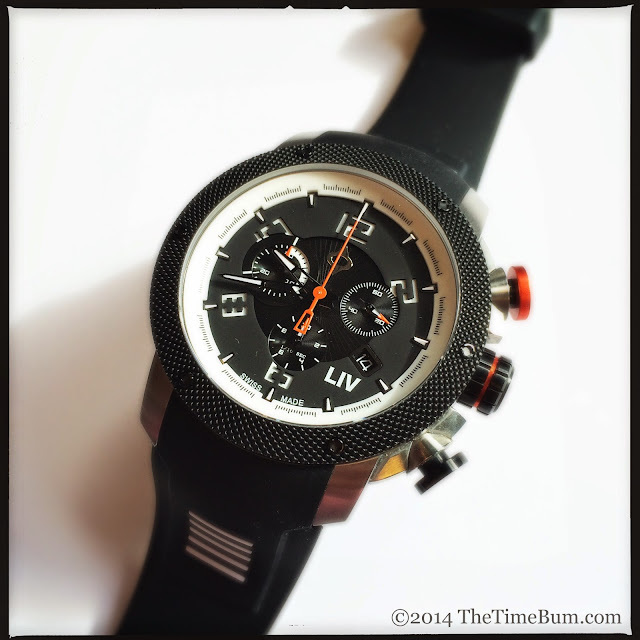 LIV stands behind their watch with a 5 year warranty. 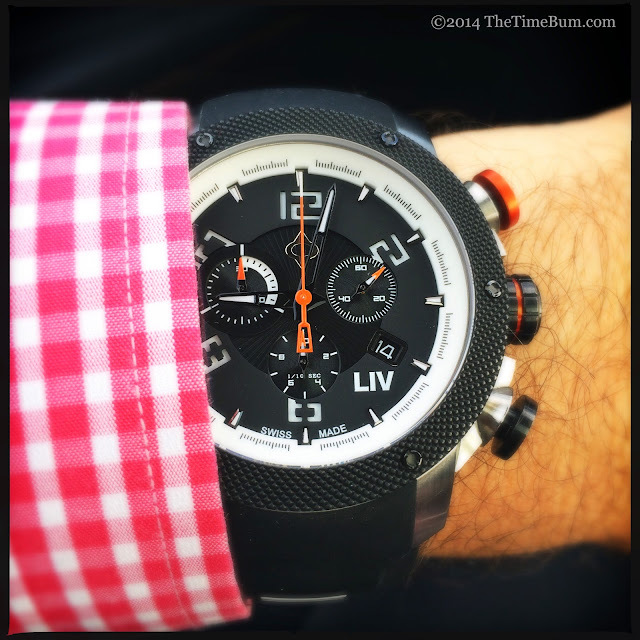 Whatever else the LIV Man may be, he obviously likes a big watch. The Genesis X1 is unapologetically huge at 44mm across, 54mm long, and 14mm thick. A flat back, long and thick lugs, and vertical case sides make it appear even larger. 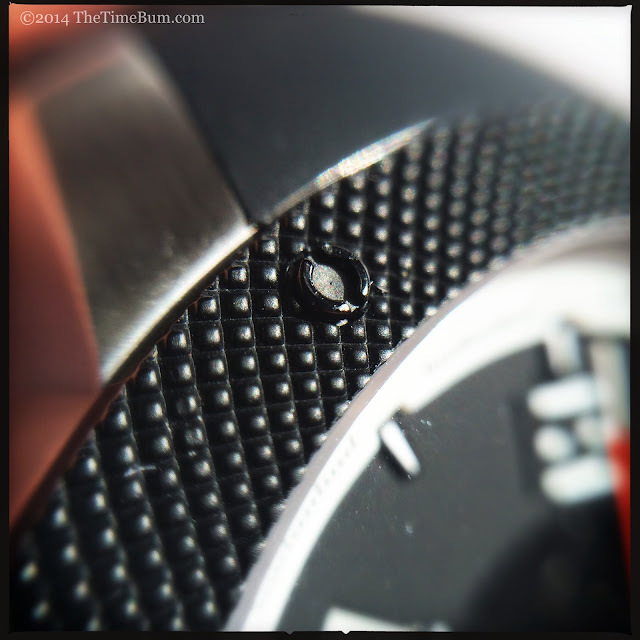 The watch wears a broad, fixed bezel with a knurled texture, black IP finish, and decorative rivets. It is similar to the cases of the Burberry Endurance, and the Fossil Machine Chronograph. 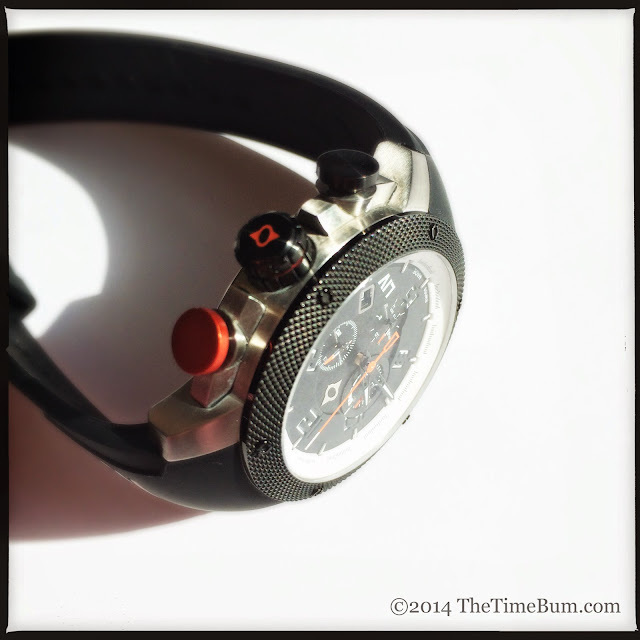 The chronograph buttons are broad plungers that emerge from large sculpted housings. Their heads are finished in red and black, flanking a fat black and red screw down crown, signed with the LIV logo. The case back also bears the LIV logo, this time in vibrant orange, and what is awkwardly described as a "screwed down case with screws." (Instead of nails, perhaps?) The Kickstarter video explains it better, making it clear that the case back is not threaded, but secured with six individual screws, the heads of which are exposed, mirroring the rivet design on the bezel. It a solid, attention grabbing unit. When you strap it on, you notice its prodigious mass on your wrist, and so will everyone else. Massive as the watch may be, I found it easy to wear, even on my 6.5" wrist. This was aided in large part by the soft 24mm silicone strap that masked the tiny bit of overhang, and provided a snug, comfortable fit. 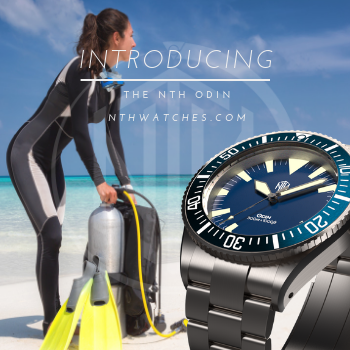 It is matte black and nicely contoured, and although I could have lived without the white, gill-like accents, they are not out of place on a sport watch, and tie to the white chapter ring. "LIV is NOW!" is molded on the inside. I have no idea what this means, but as it is not visible when the watch is worn, it hardly matters. I am very picky about rubber or synthetic straps, but this one is a quality piece. 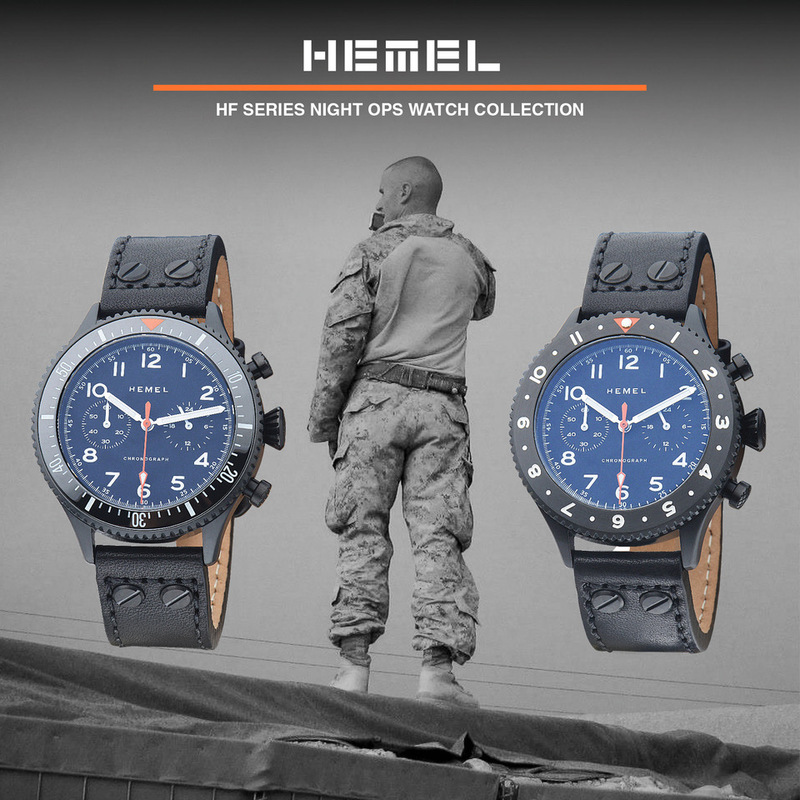 Backers will get two straps with their watch and may select a leather as well. I did not sample the leather, but online illustrations show a crocodile print with contrasting stitching to match the watch's accent color. The black dial is multi-layered with oversized, squared numerals at 12, 2, 6, 8, and 10, in a radial orientation, stencil cut to reveal a colored section beneath (white on this model), much like the Welder K24. The center section is also cut away, truncating the 2 and nearly obliterating the 6 and 10, to reveal the white-on-black sub dials and a glossy black layer beneath that is textured with ribs that radiate from the center. This central cut out links the three sub dials but appears oddly asymmetrical, as the minutes sub dial at 9 o'clock has a ring not shared by the other two. This bothered me as the anomaly is not sufficiently pronounced to look intentional, but just enough to make you wonder why it looks funny. A white chapter ring surrounds the dial and is notched around applied, polished, lume filled darts that mark the hours. The hands are bright orange and semi-skeletonized with SuperLuminova at the tips. 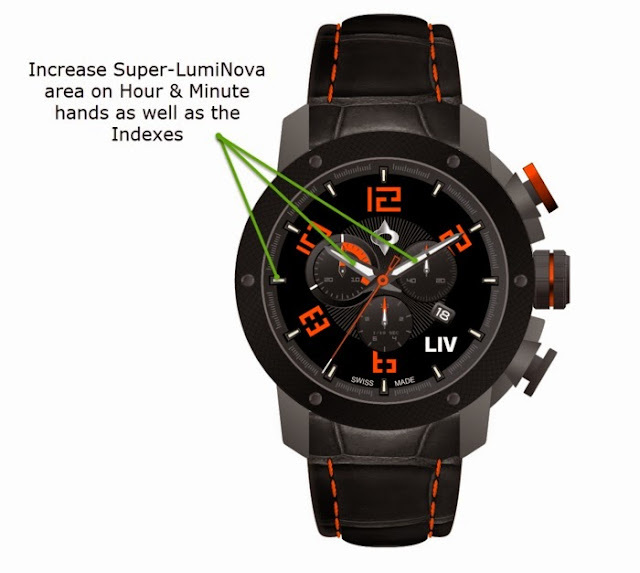 Remarkably, they also managed to squeeze in a white-on-black date window, the LIV brand, and a logo. It is quite a lot to pack into a dial, and I found it a bit overwrought. 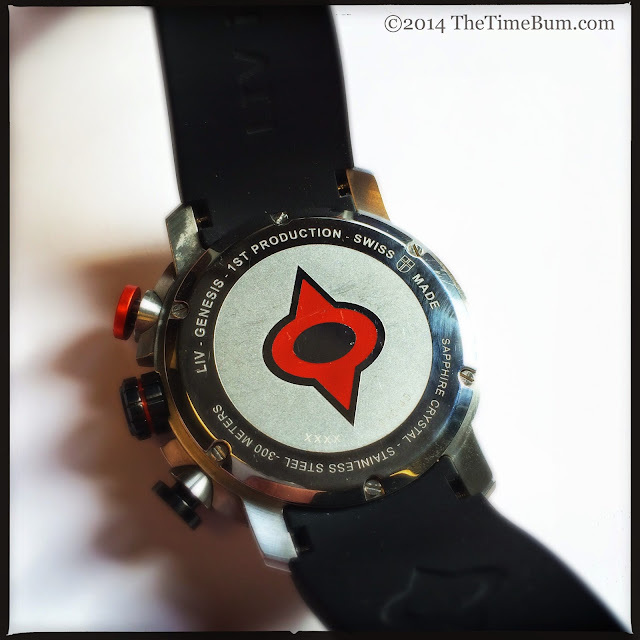 As a practical matter, the prototype dial is difficult to read. The second hand is clear enough, but the minute and hour hands are lost. At night, it is not much better as the lumed areas of darts and hands are just too small to be useful. The production version will have more luminous area on the hands and markers, which should greatly improve both day and night visibility. Still, this layout is a compromise of fashion over function. The movement is a Swiss made Ronda Startech 5040.D, a 13 jewel, gold plated quartz with 3-eye chronograph function and date. 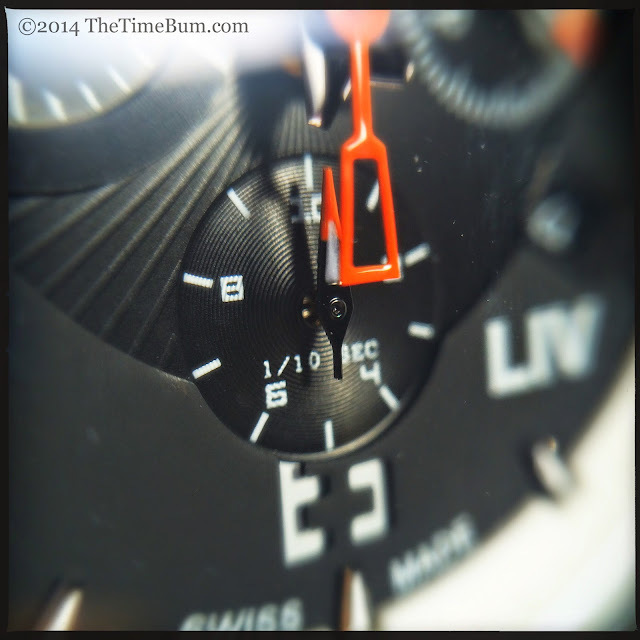 The sweep hand runs with the chronograph, and it has sub dials for seconds, tenths, and minutes. I appreciate a chronograph that measures fractions of a second. To me, that is part of the fun of owning one. Those big chronograph plungers are a signature design element, and they feel pretty good under your thumb, operating with a satisfying mechanical click. On the other hand, their broad heads and high placement leave them exposed to accidental operation. This is really only a problem if the watch is submerged, and without a timing bezel, it is clear the X1 is not intended for use as a dive watch, but given LIV's emphasis on the X1's 1000ft water resistance rating, I wish they would have incorporated screw down collars to protect the plungers from being inadvertently depressed and compromising the seal. Finally, there is the question of value. LIV's Kickstarter promotional materials lament the dearth of sub $1000 Swiss chronographs, and says the $390 Kickstarter pledge is "$1500 less than you would pay for a comparable Swiss chrono." It is true that you could pay over $2000 for a Swiss quartz with similar specs, but I can't imagine why you would. There are plenty of fine Swiss chronos available for far less. If I wanted a 300 meter, sapphire crystal, Swiss made, quartz chronograph, I'd consider the Tissot Seastar 1000 with the ETA G10.211 that lists for $695. It is more than the X1's pre order price, but not much more than its MSRP, and the extra cash gets you a ratcheting dive bezel, helium release valve, screw down collars on the chronograph buttons, and a legible dial. 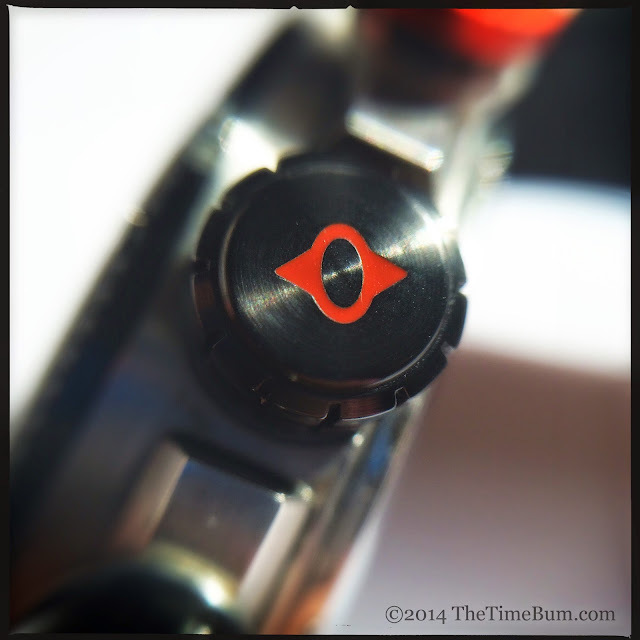 If you are willing to forgo the "Swiss Made" label, even more options open up. 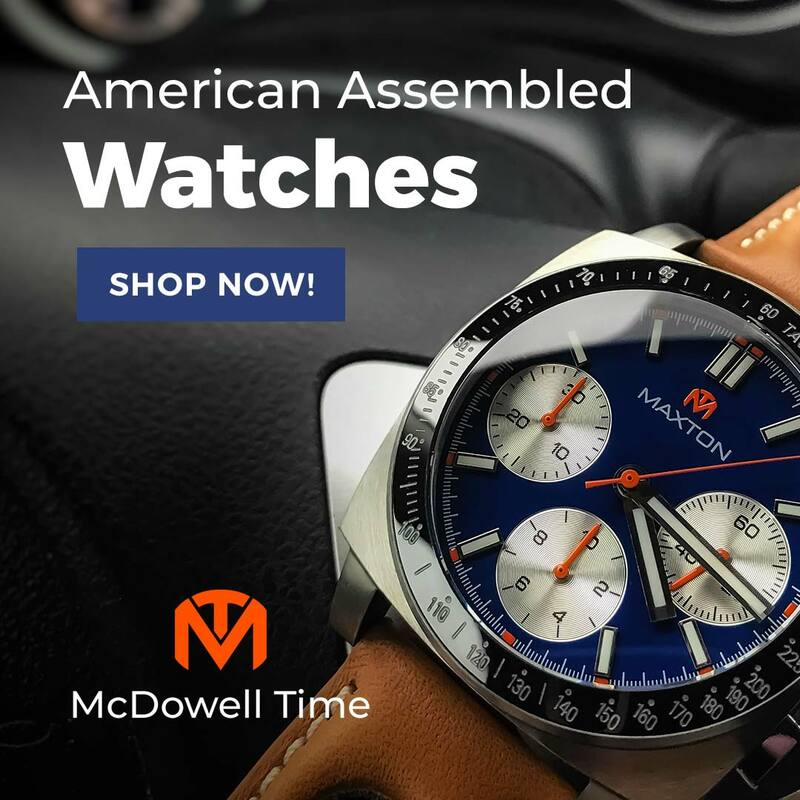 For example, the Deep Blue Sea Ram Chronograph may be assembled elsewhere, but it uses the same Swiss made Ronda movement as the X1, and boasts 500 meters water resistance. It lists for $449 and is often available for less. Touch of Modern has them on sale now for $299. Of course, these are both traditional divers, so if you really like the look of the X1, $390 is a fair price. 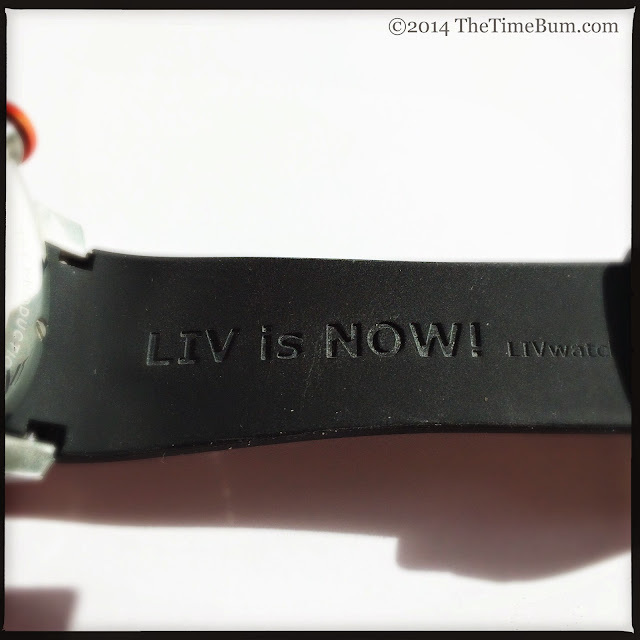 Indeed, the LIV Man may not want a conventional watch. He is likely looking for something that is hipper, edgier, and more of a bold fashion statement. As for me, while I appreciate the idea of an affordable, high spec, sports chronograph, the Genesis X1 is just not my cup of tea. Pro: Burly case, comfortable strap, long warranty. Con: No safeguards on plungers, crazy dial. 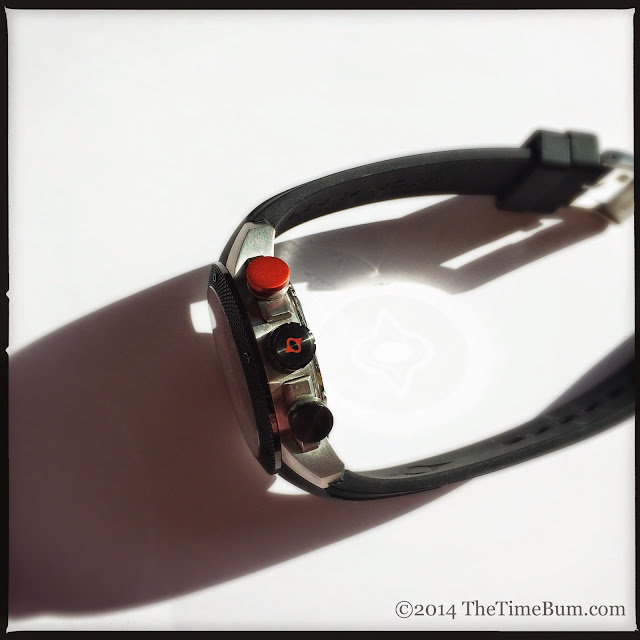 Sum: A solid timepiece, but The Time Bum is not a LIV Man.